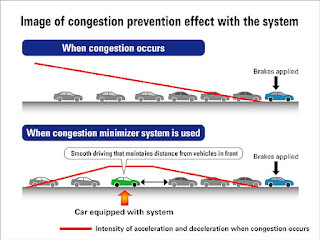 Honda Motor announced the successful development of the world’s first technology to detect the potential for traffic congestion and determine whether the driving pattern of the vehicle is likely to create traffic jams. It's been developed in conjunction with the Research Center for Advanced Science and Technology at the University of Tokyo. 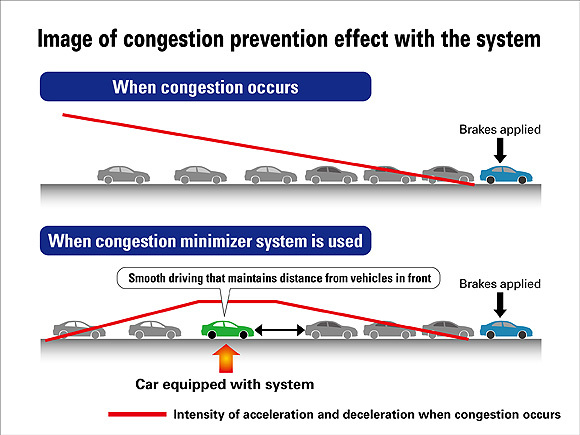 Rather than providing information to help the driver avoid existing congestion based on current traffic information, the system monitors the acceleration and deceleration patterns of the vehicle to determine whether the driver’s driving pattern is likely to create traffic congestion. Based on this determination, the system provides the driver with appropriate information, including a color-coded display through the on-board terminal, to encourage smooth driving which will help alleviate the intensity of acceleration and deceleration by trailing vehicles, thereby helping to prevent or minimize the occurrence of vehicle congestion. The test results demonstrated that the system helped increase the average speed by approximately 23% and improved fuel efficiency by approximately 8% of trailing vehicles. Good blog to discus about a virtual place to discuss between experts the latest news about automotive electronics, hybrid and electric vehicles, communication linked to mobility. This is the official blog of 2012 CESA congress in Paris.Good work keep it up !!! The site is made in different languages. We hope to see you in 2016, for the next edition of the CESA congress. For those who attended, and for those that didn't, here is a slideshow of the event. Enjoy and greetings from all the team. 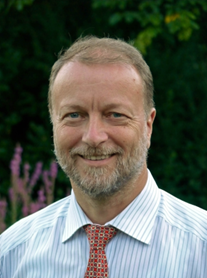 Dr. Hans-Peter Schöner from Daimler will participate to CESA 3.0. On december 4th, he will make a presentation about "Challenges and Approaches for Testing of Highly Automated Vehicles". He will also join the same day a panel session dedicated to standards, tests and validation. This expert studied electrical engineering at Rwth in Aachen (Germany) and at Purdue University (USA). He received a PHD degree from Rwth Aachen for his thesis on “monitoring of batteries for electrical vehicles”. Since 1989 he has been working for Daimler AG, first in the research field of actuators, mechatronics and new power supply systems. Since 2004, he is responsible for the development of new testing methods for chassis and driver assistance systems, as well as for setting up research vehicles in this field. Since 2012, he is also head of the Daimler driving simulator center in Sindelfingen. 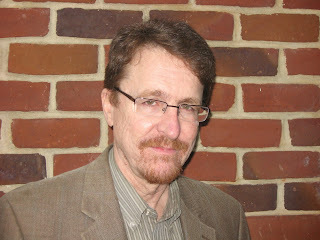 Principal from Bishop Consulting, Richard Bishop will participate to CESA 3.0. You will hear from him on december 3rd, in the first round table about worldwide market. This expert specializes in the domain of intelligent, connected, and automated vehicles and how these interact with the roadway and transportation system, plus larger societal forces. He provides global trends analysis and research strategy development to a wide range of vehicle manufacturers, technology developers, and government agencies around the world. He currently serves as Vehicle Automation Expert for the Association of Unmanned Vehicle Systems International, plus supports USDOT’s involvement in the Tri-Lateral Working Group on Road Vehicle Automation. He was recently named chair of the American Trucking Association’s Task Force on Automated Driving and Platooning.